Judging from the amount of homemade jam, pickles and chutneys that I now have stored in the larder, you’d be forgiven for thinking that I was some sort of Domestic Goddess like Nigella Lawson (I wish) or Martha Stewart. In the past few weeks we’ve been inundated with gifts of cherries, plums and apricots. Not just the odd bag full but crates and crates of the beauties. Up until last month, I’d never made a pot of jam in my life but rather than let kilos and kilos of good fruit go to waste, I decided to try my hand at making jam and chutney. The first batch of plum jam was an unmitigated disaster. Unlike the real Domestic Goddesses, Martha and Nigella, mine set like concrete and all 12 jars had to be tossed straight in to the bin. Determined not to let the culinary failure put me off, I swiftly set about making batch number 2. Batch number 2 was, even though I say so my self, a howling success. Plain plum jam, spiced plum jam, spiced plum chutney, plum compote – every permutation of plum jam that you can think of. Ditto the apricots. It’s very touching the little things that turn up on our doorstep here. I often come back home to find bunches of herbs, flowers or packets of handmade soap, left anonymously by kind souls. It’s these little things that make living here so special and out of the ordinary. And it is partly because of this that Pete and I started up our art school in the village sooner than we had planned. Blown away by the kindness and generosity of our new neighbours, we wanted to help our little community here by giving something back to them. In early March we started giving free art classes to the children in the village. Despite the language barrier we have managed to make some great work with them and they seem to really love it. Classes run for 2 hours every Friday and we work on all sorts of projects with them. 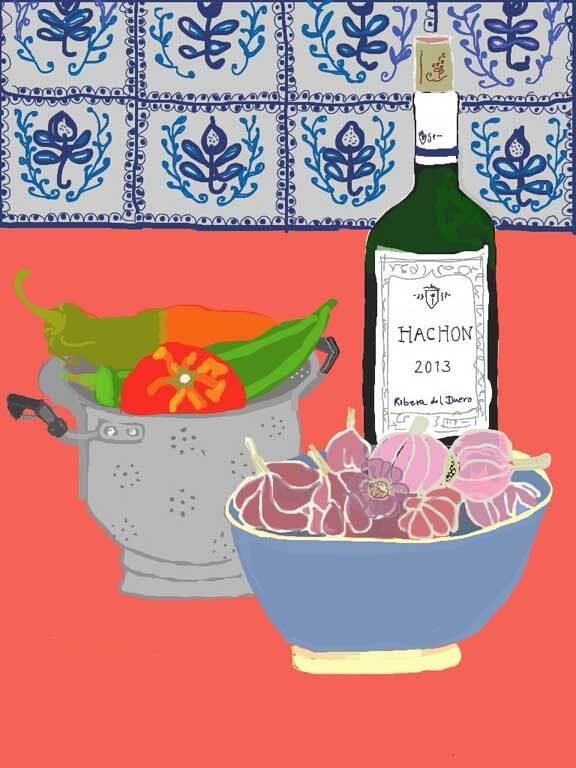 The lesson is taught in Spanish and English with a little art history thrown in for good measure. The mothers are now keen for us to give over one evening a week to teach them – our little dream of having an art school in Las Pilas is really starting to take shape. The next stage is to find a studio space large enough so that we can host residential art courses but first we have to do some more work on the house. New windows are being made for the front of the house so the room that we’ve been using as a temporary studio has had to be abandoned while the work is being done. With no more jam to make, or studio to make a mess in, I needed an outlet for my creative juices. This is how I discovered the joys of drawing on an ipad. It takes a bit of practice and I am still trying to master it. These pictures are ones that I’ve made over the past week. The one titled ‘Road from Venta Velero’ I drew this morning. Midday in the height of an Andalucian summer is probably not the best time to do ‘plein air’ drawing. After 20 minutes the ipad was so hot that I feared that it might burst in to flames so I had to abandon my landscape drawing mission and head back home. I’m enjoying your drawings Lottie. There is so much energy, and even animation in your still lives and landscapes. 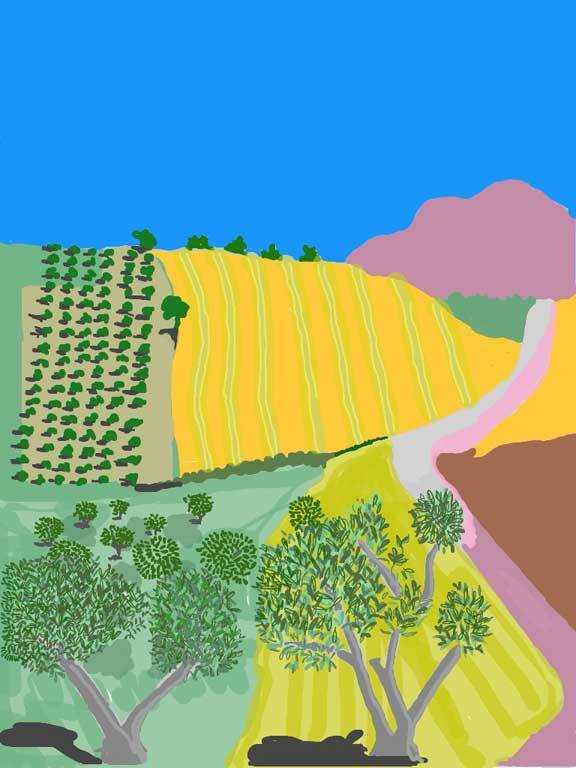 I think of Matisse’s “The Dessert” with the bright colors and organic line treatment. Definitely keep it up. What app are you using? And do you have a stylus? Or just your finger on the iPad? I haven’t tried any of that stuff yet. I cannot believe you did those on an iPAD! Gee Lottie how many talents do you have? I admire your ability to deal with and deal out just about anything that comes your way. I really am enthralled by your art. I’m not sure how to define your technique but I like it very much. I believe your neighbors are more than thrilled to have you and Pete as neighbors. That is one factor that plays into their generous gift giving. I’m sure that there are not that many ex-pats that have been given so much. And you and Pete are generous as well. The art school will reap dividends in ways that you will not have expected. The old mill across the street would be ideal as an art studio if it has good flooring and sound structure. Myabe the owner would lease it or allow some “fixing up” of the building. Loved the post as usual and I’m always anxiously awaiting the next one. I wonder what Apple would say about iPad flambeau? I think I mentioned this elsewhere, but your drawing are excellent, Lottie. Whether done with physical media or digitally, they are very attractive and, I am sure, would look very nice gracing a wall somewhere. The sooner you can get your art project up and running the better. 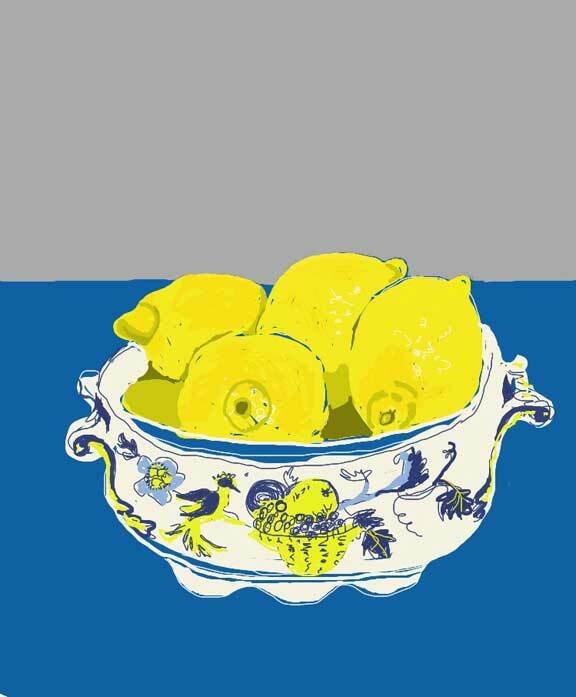 The artwork is stunning, I especially love the Spode bowl with the lemons. 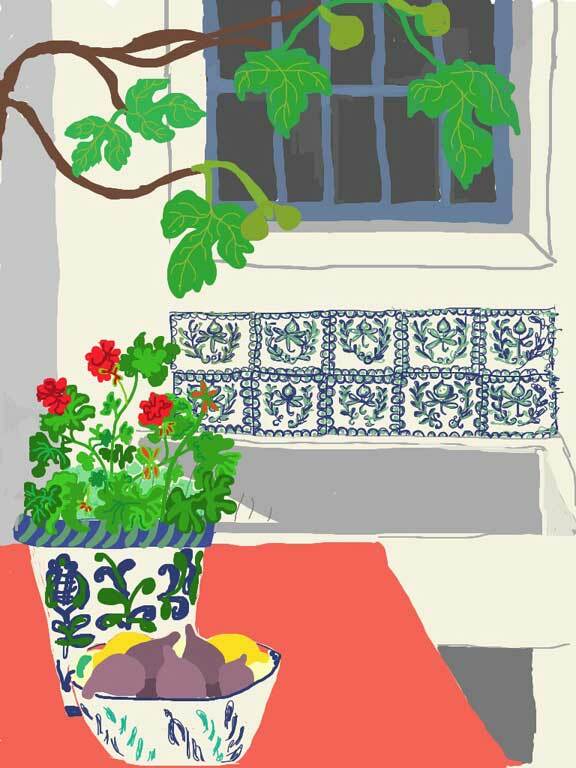 The work has a real Mediterranean feel except maybe the ipad ones but what a skill you’ve shown with that. Congratulations. I hope the work on the house is finished soon. 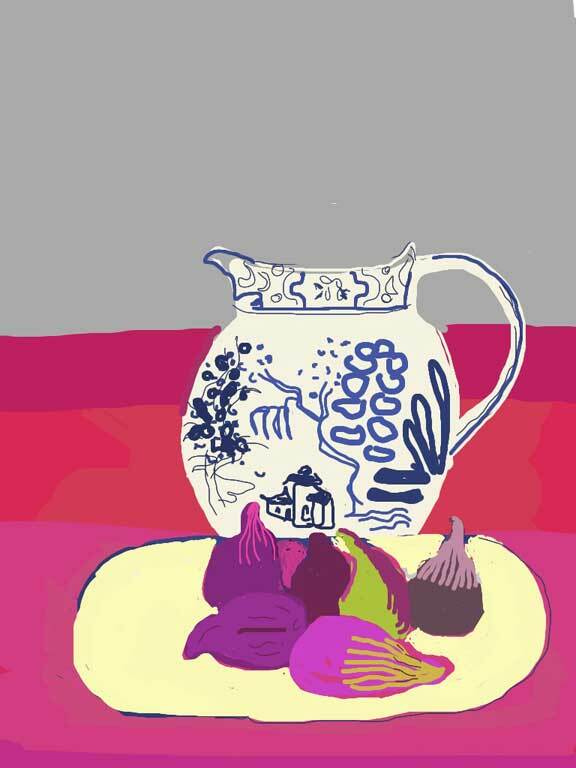 David, all of these were drawn on the ipad but some are ‘freer’ than others – simpler designs often work better. 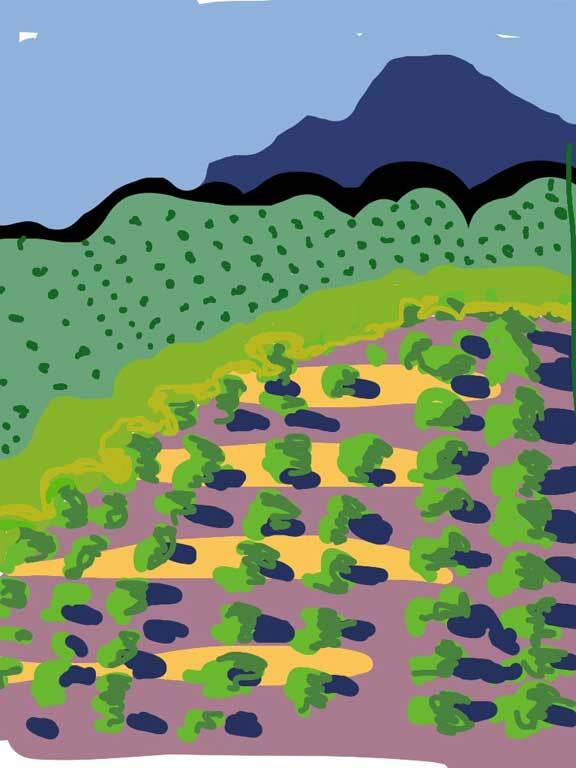 My favourite of the lot is the olives at sunset – I drew it in 7 minutes after 3 Gin & Tonics! – well the sun was over the yard arm! Well, I wouldn’t like to see you slave over a hot paintbrush ( or is it paintpad) while you’re thirsty. I bet you did it in 7 mins in case the drink evaporated from your glass and you needed a refill. What I meant was I preferred those with stronger colours which I thought were actual paintings but if you did them all on the ipad well done. Something with a twin or double bed should bring in a nice weekly income for a good part of the year and allow you the freedom to do as you want in the off season. I’ll keep a room free for you both. 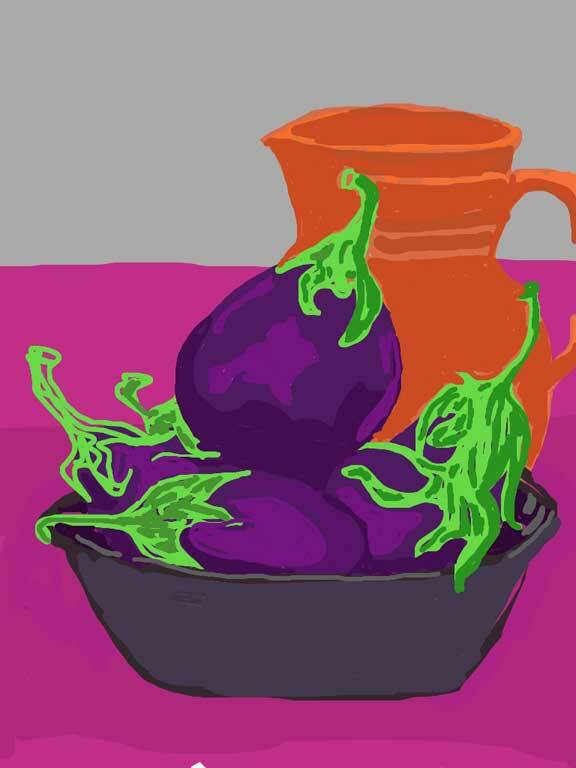 Love, love the artwork, the aubergine one. I’ve never made jam, lemon butter is as close as I’ve come. Free art classes for the kids, how lovely, good luck with the future art school. Oh I am jealous, I wish someone would drop baskets of fruit on my door step. After picking sour cherries from my uncles trees to add to the mini cheesecakes I made, hubby and I decided we need our own fruit tree. In the fall, we will can as much salsa as possible, our favourite. Another vote for spode & lemons. But the whole collections fizzes like a good glass of well, fizz. Communities seem to thrive in remoter places and the generosity of spirit feels strong here. Lucky Lottie, I dub thee. You are sinfully brilliant with color! One of those village children, under your kind tutelage, will probably be the next Picasso or Matisse. Oooh, I like that – I’d like to have that on my gravestone – ‘She was sinfully brilliant with colour’ what an accolade! I’ve got to admit that Pete and I really hope that some of what we are teaching the kids will rub off on them – it would be lovely to think that maybe one of them ends up making a living through their own creative endeavours. Lottie, it all looks fantastic. 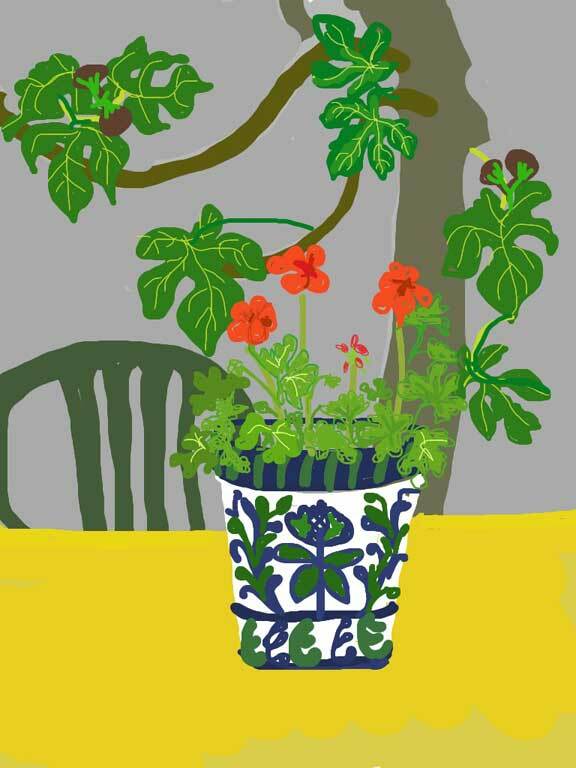 I managed to catch David Hockney’s exhibition in London and I was amazed at what he managed to do with his i-Pad. Well, he has competition! And I so hope everything works out for the art school and the workshops. I have no artistic bone in my body (at least for painting, or singing, or dancing, or….) but would love to have an excuse to visit….Maybe you should give jam-making classes too! Olga, I think I shall give the jam making classes a miss!! 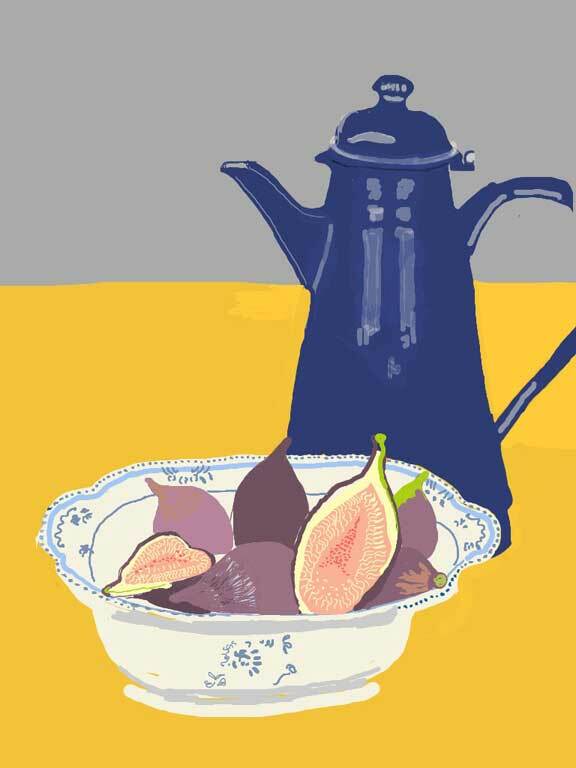 Lucky you seeing the Hockney exhibition, very jel about that 🙂 You are welcome to visit anytime and I am sure you could turn your hand to anything, you are a very talented lady. We are also going to set up a print studio, you never know, that might become your forte! A splendid project- start to you both!!! Brilliant work Lottie. In fact I’m impressed, almost flabbergasted, even gobsmacked that you created these masterpieces using wine…….no……an iPad ! I love the last one ! I met an Irish friend in the Correos (post office) two days ago. She and her French husband run a small holiday business using 3 Tibetan yurts in the field. Their profit for this month disappeared when their dog got into a guest’s yurt and chewed their iPad to pieces. Crunchy ! Hi Lottie, I’m so impressed by your artwork and have tried to choose a favourite but each have their own charm! The sunshine and slow pace definitely brings out the best in you 🙂 And the art school…it will be so rewarding for everybody involved! What a fab tool. Love these. Truly amazed. I have reblogged this to appear tomorrow on Fizz. Everything is an opportunity if looked at the right angle. And you certainly have that down, Lottie. 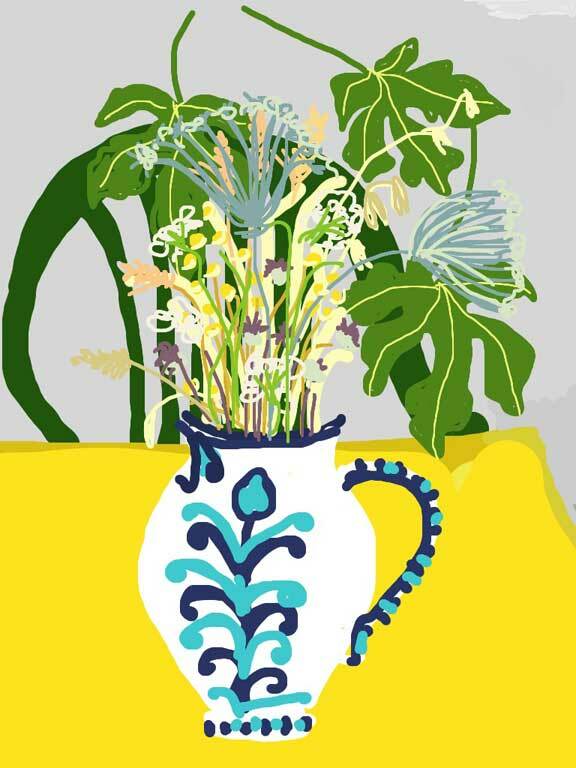 Your studio being off limits temporarily led you to creating these marvelous and vibrant iPad drawings. Hooray! Your art school sounds amazing. Build it and they will come, eh? Bravo to both you and your Irish man. Clearly your passion is in art and creativity. I particularly liked the ‘Chair in the Sun’ creation of yours. Somewhere it brings in a serene sense. I remain curious. What makes you visualise what you end up creating? Thank you, Shakti for your lovely comment 🙂 I’m delighted that you like the pictures. In answer to your question, most of my pictures are spur of the moment. For example I will see something and think ‘oh, that’s beautiful, or, I love that shape’ etc etc and start drawing it. 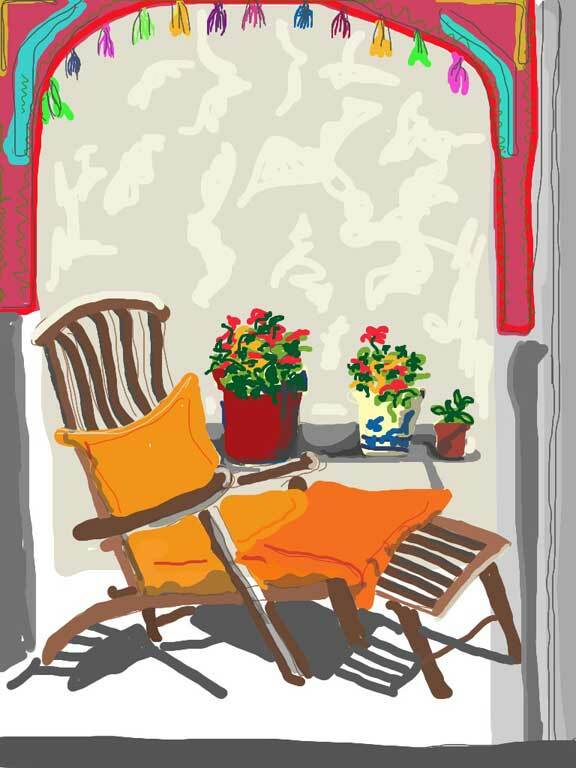 Again, I drew the chair that you liked on a whim – i was inside with the door to the garden open and i noticed the white light and the shadows that the chair made. it was a quick drawing. Sometimes I dream about pictures/paintings. I spend time thinking about what I want to make, I suppose pictures are always in my head, it is just finding the time and the right moment to make them! What an inspired idea the art school is. Love the pieces, especially the lemons. You make me want to pick up my iPad and doodle.